We have been running 7.9.3 applications on 10.1.3.3.1 platform. 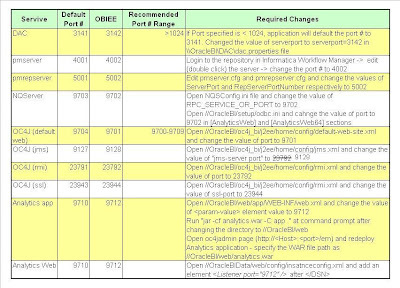 We raised with Oracle on margin related metrics not being available in 7.9.3 and we got a response that it is enhanced in 7.9.4 apps. We decided to install 7.9.4 applications with 10.1.3.3.2 platform on the same development machine but on a different mount point. With 7.9.3 installation experience, we decided that we will install 7.9.4 and at the same time have 7.9.3 running as long as we want and scrap 7.9.3 sometime when we are happy with 7.9.4. We installed 7.9.4 apps and platform from the new media on a different mount point with the default ports but did not start any services after install. I modified all the different required ports in 7.9.3 and started 7.9.4 services. After some debugging, investigation and researching, we are finally up with 7.9.3 and 7.9.4 on the same machine. I would like to thank Borkur for some initial help and direction. I thought to put all the changes in a consolidated place. You may ask why is this required to have multiple instances running on same machine. Learning environment is a need but having a Solaris box for learning environment will not sell. Imagine a hypothetical case; Production will have to be upgraded with no downtime. We can upgrade in a different mount point and after validation, the old environment can be dropped. In fact, we already made a decision to not install the Production BI apps on the default ports.